"A Test Before Trying," this week's new episode of The Simpsons Season 24, went back over some familiar territory, as Bart was pressured into actually studying for an exam. 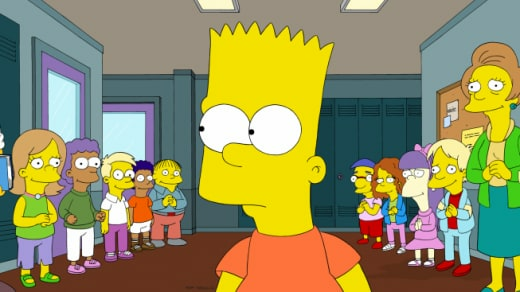 Of course, Bart isn't very good at studying, and his struggle to stay focused after getting not one but two days of extra study time was reminiscent of the second season episode "Bart Gets an F." On that installment, a freak snow day got Bart the extra time he needed to avoid repeating the fourth grade after he spent the whole day putting off studying. This time around, there's a lot more riding on Bart's test performance. As the only student who didn't take the standardized test, his score could save Springfield Elementary from being the worst school in the state and, ultimately, being shut down. That's a lot of pressure! 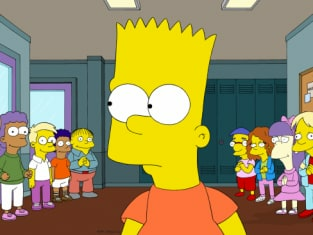 While part of the storyline seemed vaguely familiar, I thought the episode provided an interesting twist to Bart's studying problems. In satirizing standardized testing and the unfair amount of pressure they place on students, the show found a really relevant and important issue to tackle...in a hilarious way. The dodge-ball-obsessed gym teacher correctly identifies the problem with these exams when he says he doesn't teach for exams but for real life issues. While his insight was undercut when he tossed a dodge-ball in Skinner's face (Ha! Ha! ), it was a good point. Plus, playing the Halloween-theme over the poor students suffering through the exam made the right connection as these kids were "murdered" by the exam. Bart's plot definitely showed how much he really cares about others, and it was amusing to watch his little game with the bug come back around to help him out. Less amusing this evening was Homer's attempt to make a little extra money with a parking meter. Homer's had some ridiculous schemes in the past (remember the telemarketing machine? ), and while Homer did seem aware of how stupid his money-making idea was, that didn't stop him from letting this one play out. Oh, well. It made for some hilarious The Simpsons quotes, but that's about it. The whole thing seemed so tacked on and arbitrary that I didn't really find myself enjoying Homer's exploits. How about you? Never convicted. They couldn't find the body. Anyone care for some chicken-pete-pie?